You don't need a daybed to get the daybed sofa look. A regular twin bed with a headboard and footboard does the trick. Arranging your twin bed like a daybed turns a seldom-used guest bed into year-round seating, or a place for your child to entertain. The keys to making the bed look and function like a sofa are turning it lengthwise against the wall and arranging the pillows sofa- style. Rest a pair of 26- or 28-inch Euro pillows against the wall, which functions like the backrest of a sofa, one at end each of the bed. Angle the outermost sides of the pillows slightly toward the front of the bed. 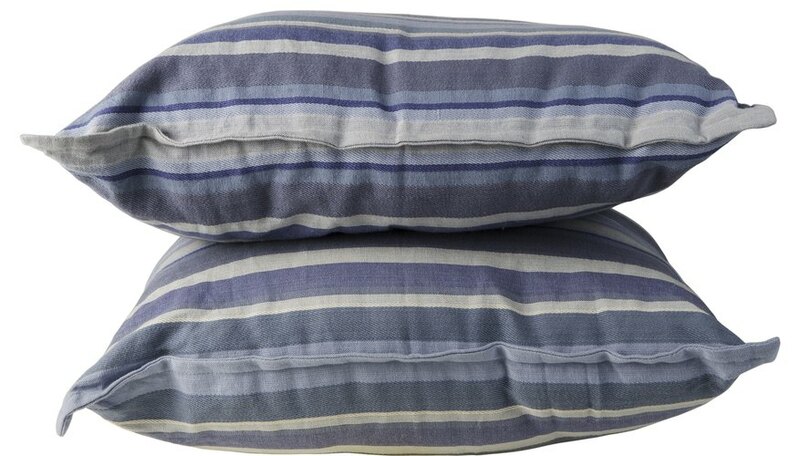 Stand a third Euro pillow between them; the sides will overlap the outer pillows just a bit. The Euro pillows function like a sofa's back cushions. Add tube-shaped bolster pillows at each end of the mattress to serve as sofa arms. Place them against and parallel to the head- and footboards, with the round front ends even with the front of the “daybed sofa.” Use bolsters measuring 35 to 38 inches long, with an 8- to 11-inch diameter. Angle a pair of 18- to 22-inch square pillows at each end of the bed, against and in front of the end Euro and bolster pillows. Place them like throw pillows at each end of your living room sofa. Overlap a smaller pair of pillows -- 14 to 16 inches square -- with the inside edges of the 18- to 22-inch pillows. Place them at the same angle as the larger pair. Place a final accent pillow between the two 14- to 16-inch pillows; it's fine if the sides overlap. Use another square pillow, or vary the look with a round or rectangular pillow. Choose a size that's slightly taller or shorter than the 14- to 16-inch pair, but keep it under 18 inches high. Hide your sleeping pillows behind the Euro pillows as back cushions. They'll be out of sight, but handy. They'll also reduce the daybed seating depth. When turned sideways, twin mattresses are 39 inches deep, which is greater than the 33 1/2-inch seating depth of an average sofa. For the most authentic sofa look, choose Euro and bolster pillows with welt or brush fringe at the seams. Both give the pillows a finished appearance without looking too busy. Sofa cushions and arms rarely have ruffles, tassels or flanges. Keep the look symmetrical by using the same fabric for pillows used in pairs. Each pair can have a different fabric, but the sides of the daybed sofa should mirror each other. How to Tell if a Bed Warmer Is an Antique or a Reproduction?